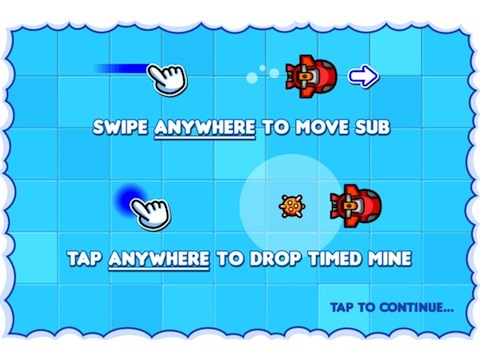 SubTub by SpaceGum is an iPad, iPod Touch and iPhone app that is reminiscent of Frogger in some ways, and is a very fun kids game that involves blowing up enemy ships and large rubber ducks. In this review everything good and bad will be covered. SubTub is a very simple application with a straightforward structure. You are a tiny sub that is being confronted by a lot of larger ships. So, what do you do? Blow them up, of course. You have to drop timed mines that have an explosion radius, destroying ships directly on the mines and those nearby. The ships come at you in rows and you have to avoid them, which in many ways looks like the original Frogger. To beat a level, you have to destroy a certain amount of ships. You are graded on your performance based on how many mines you used and how long it took to beat the stage. Some ships in later levels can also drop mines, and you will have to avoid these to keep your sub alive. The controls are perhaps the easiest to learn in SubTub. 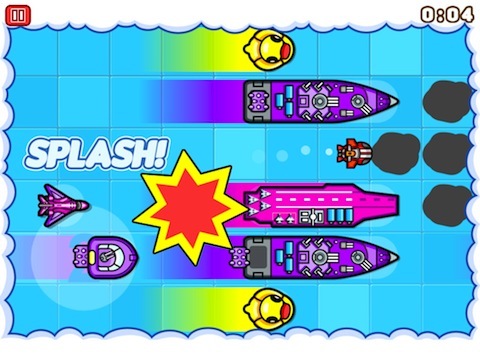 You use your finger to navigate the sub through the water, making sure you avoid the other ships in your way. You will normally go at a constant speed, unless you hit squares that slow you down. To lay a timed mine, you just have to tap the sub. You can lay as many mines as you want, and there will be a white circle around them showing you how far the explosion goes. Try not to be around the mines when they explode, as this can destroy your sub. There is some fun and upbeat music in the background as you blow up the other ships. However, there are not many tracks, so the music may become annoying if you don’t like it. The graphics are very color and kid-friendly, as this app is meant for children 4 and up. Everything is very easy to see and, from a close inspection, there were no major graphical errors during gameplay. However, the graphics are stylized and not realistic, so for people who only play realistic looking games, you may not like SubTub. SubTub costs only $0.99, and it is certainly worth it. You can easily get out hours of fun from this app, regardless of your age. Some advanced gamers may not like it, as the app is simple, but those just looking for fun will certain enjoy this app. SubTub is a fun and simple app that really has no flaws to speak of. There is no multiplayer support, but this type of app would be awkward with multiplayer, so its best left out. Perhaps the only bad thing to say about it is how simple it is, but it is still very fun. AppSafari review of SubTub was written by Joe Seifi on December 22nd, 2011 and categorized under App Store, Arcade, Fun, Games, Kids. Page viewed 3294 times, 5 so far today. Need help on using these apps? Please read the Help Page.